Last Updated: November 13, 2015 By Katie 2 Comments -- Paid Promotion. Disclosure policy here. 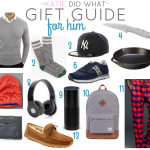 I’m back today with two more gift guides- one for him and one for baby! 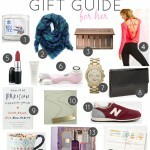 In case you missed it, be sure to check out my Gift Guide for Her! Now, the guys. They can be tricky. 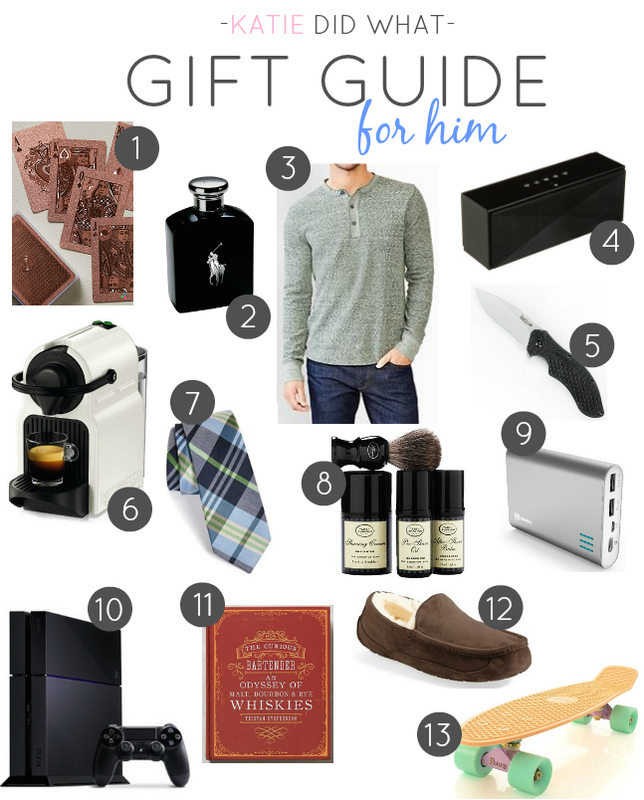 So I had my own guy help me out with this particular Gift Guide for Him, to make sure it’s actually stuff that real guys would want. And not, you know, stuff that girls want their guys to want, if you know what I mean. And I think you do. 1. Playing cards – Talk about some awesome cards to use at his next poker night. Or just a cool conversation piece. 2. Cologne – Ralph Lauren Polo Black is my hubby’s signature scent and thus the one I go to time and time again, but there are lots of great ones to choose from! And it’s a fun splurge that he isn’t likely to buy for himself! 3. Henley – Because if Ryan Gosling wears a henley, your man should too. 4. Bluetooth speaker – An even better way to listen to his Pandora or Spotify stations. 6. Nespresso machine – For the coffee lover on your list. Bonus points: You also profit from this gift. Because, coffee! We have a Keurig machine, and love it too! 7. Tie – Here’s the thing about ties: They can be really pricey. Here’s another thing about ties: They don’t have to be. Also, they make a fun and easy gift for someone who haaaaas to wear a tie to work. 8. Shaving kit – This is a cool introduction to The Art of Shaving, and it’d make for a neat gift for the more refined gentleman on your list. Plus, it just looks nice on display in the bathroom, too. 10. Video game console – Because he’s a kid at heart. Video games are always good, too. 11. The Curious Bartender – Or any book that would peak his interest. Get creative! 12. Slippers – They’re always a nice gift, especially in the winter. Plus, Uggs are built for life. I also love these Minnetonka moccasins! 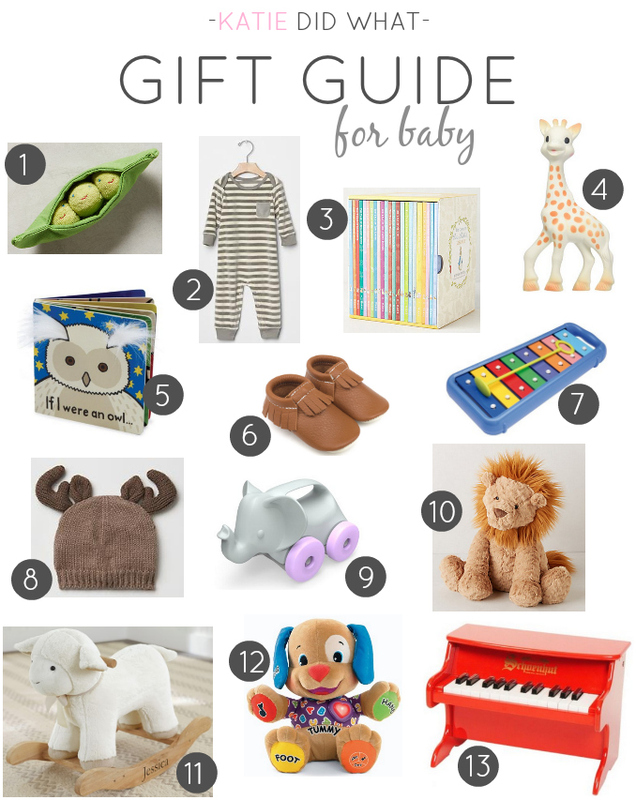 And now, the gift guide I definitely had the most fun creating- the Gift Guide for Baby! 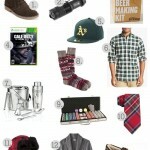 Also known as, Sam’s wish list this year (or things he has and loves)! ;) Babies are just too fun to shop for, I think we can all agree. As my dad says, something tells me baby Sam is going to be pretty spoiled at Christmas. But you know what they say. You can’t spoil a baby! I wholeheartedly agree. 1. Baby Rattle – A rattle is a baby must have, and such a fun toy for a baby, and this one is just so freaking cute! 3. Peter Rabbit library – Peter Rabbit is such a classic children’s book character, and this is the full collection of stories! Basically, it is a MUST have for any baby’s library. 4. Sophie le girafe teether – A MUST have. Sam is obsessed with this thing. So much so that I think we’re going to need another one, so we can have one in the car at all times just in case. Seriously. It’s that good. 5. Books – This one looks super cute, and I love that it’s interactive, with lots of things for a baby to touch and play with. They have a huge variety to choose from, too. Babies love board books, and you can never have too many! 6. Baby moccasins – Because they are a necessity, duh. Baby shoes are the cutest ever. There are so many great companies out there- we love these, these and these! 7. Xylophone – We just started playing piano with Sam in our laps, and he LOVES it! I’m so excited to introduce the love of music to my baby, and having little baby-sized instruments is the perfect way to do so. :) We actually got this exact xylophone for Sam this year! 8. Animal beanie – Because a baby in a hat is the cutest thing ever. And one with ears? I mean. 9. Push toy – Now that Sam is starting to get more mobile, push toys are going to be a really fun thing, and this one is just the cutest I’ve seen! 11. Rocker – We found the sweetest little lamb rocker at Costco of all places (I know! )- it looks identical to the lamb one pictured from Pottery Barn, but for a fraction of the price! So. Check your Costco! I also found this giraffe, which is super cute too! 12. Laugh and Play Puppy – Sam has this and LOVES it. He lights up and giggles whenever we turn it on, and it keeps him happy if he’s fussy, which is always welcomed. :) He especially loves the music mode and smiles at the songs. 13. Baby piano – How. Cute. Is. This. Sam is definitely too young to really play this, but my motto is, start ’em young. :) Plus, it’s just cute and would be such a great addition to any nursery! Are you shopping for a baby? Any other ideas that I didn’t include? LOVE all your picks and ideas! I’m especially loving that tie you linked to… I may need to grab that one for Cody eventually. Thanks girly! :) Isn’t the tie so cute?! And the price is amazing! I was surprised!